The core mission of Second Harvest Food Bank remains to capture as much of the ‘extra’ food in our society as possible, and make it available for the clients of our partner feeding programs. With the support and generosity of food manufacturers, wholesalers, distributors, growers, and others in the community, Second Harvest Food Bank was able to distribute nearly 58 million meals for our neighbors in need last year. Much of this food was gathered from local sources, while a significant portion came from outside Central Florida through the incredible work of Feeding America, the nation’s food bank network. Second Harvest also distributes food made available through the USDA's Emergency Food Assistance Program (TEFAP), and food collected through community food drives. Second Harvest relies on a variety of sources in order to get food out into our community and into the hands of our hungry neighbors. This important food recovery program collects wholesome, unsold food from more than 450 participating retail store locations throughout Central Florida. The Grocery Alliance product mix – which includes meat, produce, dairy, bakery and dry goods – offers a wide range of nutritious and sought-after foods. With growing awareness of the link between nutrition and health, Second Harvest has committed to increasing the amount of fresh fruits and vegetables available to clients year-round. We work with the agriculture industry, as well as organizations such as the Society of St. Andrew and Feeding Florida, to harvest, glean and transport produce. Click here, if you are interested in donating produce. 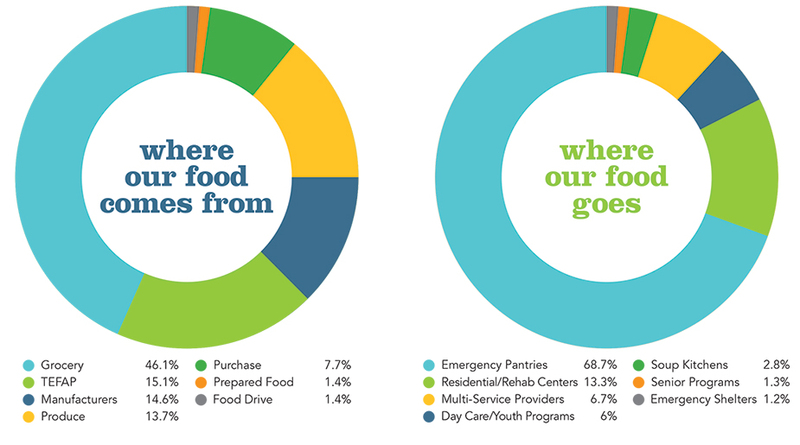 This prepared-food rescue program collects and delivers donations from local restaurants, hotels and resorts to partner feeding programs that provide on-site meals for clients. Second Harvest collects more than one million pounds of food and thousands of dollars each year through community food and fund drives sponsored by individuals, corporations, clubs, schools and associations. The food donors who partner with Second Harvest are vital to our hunger relief efforts. Click here to learn more about how your company can get involved.